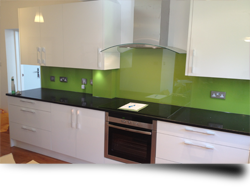 Our toughened glass splashbacks are suitable for use behind a cooker, induction or gas hob. Our glass panels can also be used in shower cubicles, bathrooms, wet rooms, as table tops or kitchen worktops. Every day, or annealed glass, can often break into very dangerous dagger like shards, and so is not suitable for use in furniture in and around the home. However, the absence of stress in such glass means that it can be worked by cutting, polishing and drilling, even after bending and annealing. Toughened or safety glass is formed from a prepared sheet of ordinary glass which has been cut to size, processed and edge worked as required. The glass sheet is then heated and rapidly chilled with cold air,which is blown onto the surfaces of the glass. This heating and rapid cooling process results in the outer surfaces cooling more quickly than the inner parts of the sheet. The result is that these outer surfaces will contract and solidify before the inside, thereby inducing permanent compressive stresses into the surfaces of the glass. This results in the increased strength and safe breakage characteristics seen with this type of glass. When the glass is broken, the stress is explosively released, producing the fracture characteristics of small, cube like fragments that are frequently referred to as dice that are relatively harmless. This is exactly the same as when a car windscreen shatters. Laminated glass, as the name would suggest, consists of two or more layers of glass which may be of any type. These layers are permanently bonded together by one or more interlayers of normally transparent plastic. Once manufactured, the laminate is considered to be one piece of glass. The plastic interlayers are intended to hold glass fragments in place if the glass is broken, making injury less likely to occur. Film backed glass has a film of flexible plastic applied to the back of the glass to hold the pieces together should it be broken. Decorated glass is a product that has been worked by acid etching, embossing, sandblasting, cutting or engraving, to give a decorative effect. Please contact us at Splashbacks of Distinction and allow us to help you realise your dream kitchen with the beauty and clarity of our toughened glass splashbacks.